Hideki Tojo was born on the 30th December 1884 in Tokyo, Japan. 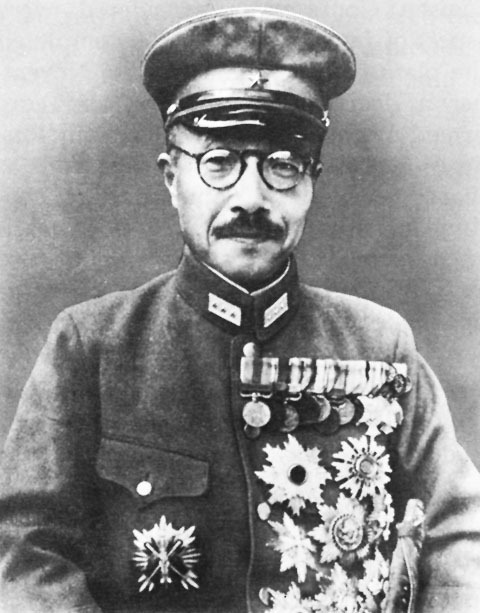 Tojo’s father was a lieutenant general of the Imperial Japanese Army. Tojo followed his father’s footsteps, and entered army cadet school in 1899. He graduated in 1905 and continued to serve in the army. Tojo, like his father, became a general of the Imperial Japanese Army. Tojo then later became the leader of the Imperial Rule Assistance Association. Tojo became increasingly interested in military politics. On the 22nd of July, 1940, Tojo became Army Minister within parliament during the second Fumimaro Konoe regime. Tojo supported the pact between Japan, Nazi Germany and Fascist Italy, and also expanded the war with China. Despite his dangerous opinions and affiliations with Germany and Italy, Tojo became the 40th Prime Minister of Japan on the 17th of October in 1941. Tojo maintained his position as Army Minister whilst in this post. Tojo led the country through most of World War II and was a popular Prime Minister at the start of the war as Japanese military forces prevailed, going from one victory to another. However, the victories started to dry up, soon after the Battle of Midway, and as a result, Tojo, and his ruling, started to face fierce opposition from the military and the government. Tojo was forced to stand down as Prime Minister on the 22nd of July, 1944. Although planning had started before Tojo was elected, it was during his rule as Prime Minister, that the attack on Pearl Harbor occurred and as a result Tojo was help responsible. The attack resulted in the initiation of the war between Japan and the US, and also resulted in incalculable deaths on both sides. Tojo was arrested after the war, and was sentenced to death as a result of numerous war crimes on the 12th November, 1948. 41 days later, Tojo was hanged, and died on December 23rd in 1948.